If you guessed that we are vacationing on the Oregon Coast, you win! Not sure what you won - I'll have to think about that. But I have plenty of time, because I'm on vacation! We have been renting the same house for a week in the summer for the past sixteen years. 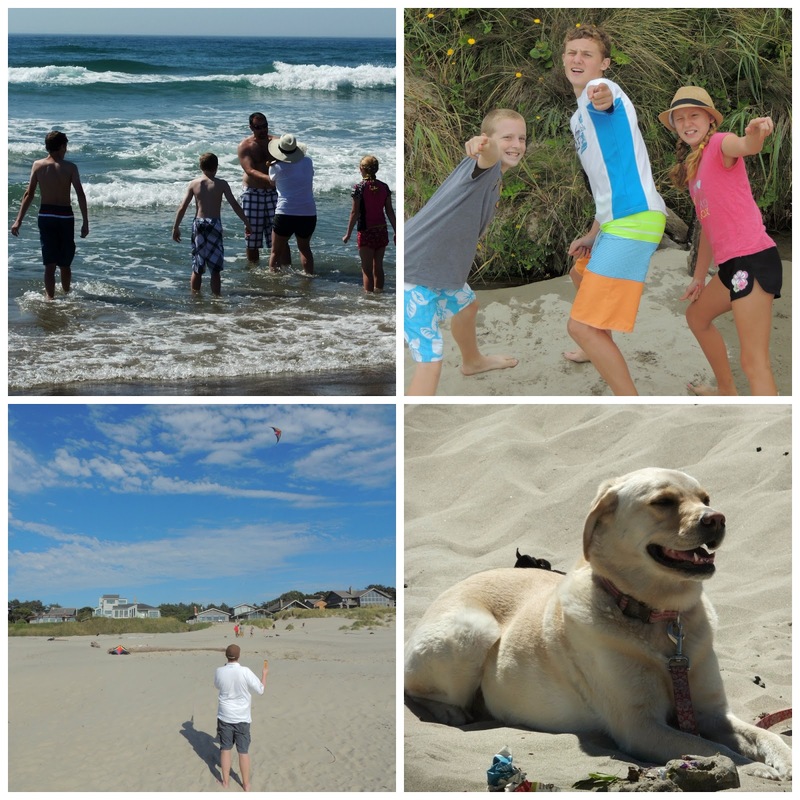 Extended family usually join us, and we spend the time relaxing, eating, and enjoying the beautiful five mile beach. Manzanita is a tiny town just south of Cannon Beach on HIghway 101 in Oregon. There is one main street with restaurants and little shops, and the atmosphere is so laid back and.....restful. That's the best way to describe it. I love coming home from vacation and actually feeling rejuvenated. Our days are spent reading and playing on the beach. If we're feeling really energetic, we throw in an adventure like kayaking or hiking. In the evenings, we walk to town for ice cream, and have a bonfire while the sun sets. 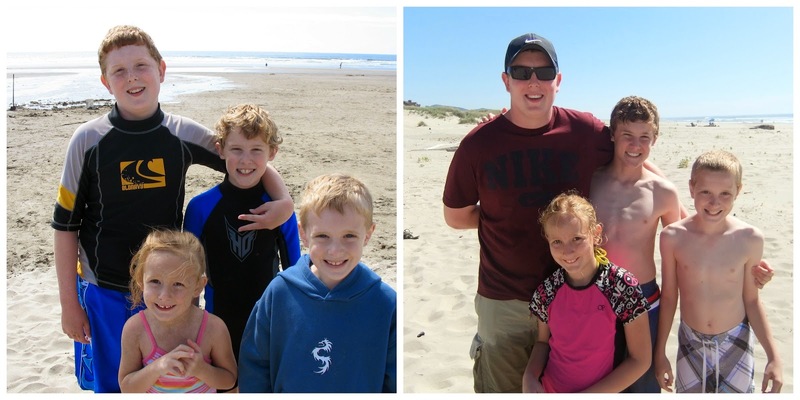 Our boys were one and three when we first discovered Manzanita, and we've been back every summer since then. They've grown up coming here - and I hope someday they bring my grandchildren too! Thank you! The sunsets there are so beautiful because there are usually clouds. Oregon is beautiful. It has become a wonderful tradition. Thanks Susan! How wonderful to have that kind of family tradition! It sounds like a restful, fun-filled week! It was so restful I didn't want to come back! aw looks beautiful and love the tradition! enjoy, you deserve every second! Thanks Shaunacey - you're so sweet! First off I won!!!!!! I'm going to figure out exactly where it is along the road. This my favorite place of anywhere I've ever been. I fell in love with the Oregon coastline and have always dreamed of moving there. I know you go to the same house every year (if it's a rental would love the info. when you get back) but we stayed at a place called Umqua Lighthouse State Park in one of their yurts and it was AMAZING! A fishing lake right out the front door and the ocean on the other side of the park. Very reasonable. Going back there next summer. Yay, you won! We love Oregon too - the coast is so beautiful. I think the lighthouse is a little bit south of where we stay. I will send you the info on our rental house. Yes, I'm always the one taking the pictures. I tried to get in a few this year! Sounds glorious, Lana! I'm more than a little jealous but hope you are having a delightful and restful time. Thanks so much Carrie - we had a wonderful time. I love this! My brother in law lives in Bend. Oregon is such a beautiful place. Enjoy your vacation! Thank you Jen! I'm so glad you stopped by. Bend is gorgeous! Sounds wonderful! Such beautiful scenery! Hope you are enjoying your vacation! What a wonderful tradition. You are making some beautiful memories.I love the beach and find it so healing. My brother used to rent a beach house every year. Such wonderful memories. The boys and I are actually planning a little getaway soon. Can't wait. Have fun on your getaway. The beach has always been very calming and healing for me too.